Our unit aims to improve the quality of clinical research by examining the research system itself. We conduct “research on research” that addresses questions related to the reliability of results, experimental rigour, transparency and waste. Our commitment to these principles extends to strict adherence of ethical standards in our own work. What does scientific integrity mean? Integrity includes all the rules that must be respected to ensure science is reliable, impartial and transparent. These principles are set out in the ‘National Charter of Research Integrity’ which we respect. The document defines acts that constitute serious forms of misconduct, including fabrication, falsification and plagiarism. The first two relate to the invention or modification of data to achieve a desired result. Plagiarism is by far the most common form. It is the appropriation of work from a third party, whether in terms of content (text, table, graph) or formalized ideas, without citing the sources. Of particular concern is the use of text translated directly from another language and the “recycling” of previously published material (self-plagiarism). There are also so-called ‘detrimental’ research practices that can be considered as forms of professional neglect. Although they are individually less deleterious, their collective impact is significant given their higher incidence. These practices include concealment of conflicts of interest, embellishment or selective use of data, inappropriate use of statistics and failure to retain data. Research misconduct undermines the reliability of science and the reputation of the people and institutions involved, and therefore, measures must be taken to avoid it. Respecting the values of the Charter is our collective responsibility. We rely on a strategy of education, prevention and detection. Open communication of results is fundamental to the advancement of science and is an obligation for publicly funded research. The concrete product of research is a publication in a peer-reviewed journal. The article attests that the work meets certain quality standards and is used to attribute credit to authors. The importance of publication requires guidelines that define the criteria for authorship and the order of authors among the signatories. To promote transparency and accountability, we strive to conduct our research according to the principles of open science. Our experimental trials are preregistered (for example, at www.clinicaltrials.gov) when appropriate. 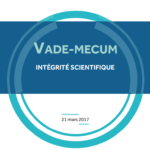 The software we develop is made public on our websites and our articles are posted on the HAL-Inserm portal. Our research centre held a seminar entitled No Research Excellence Without Integrity in December 2017. In “The Lab: Avoiding Research Misconduct,” you become the lead characters in an interactive movie and make decisions about integrity in research that can have long-term consequences. The simulation addresses Responsible Conduct of Research topics such as avoiding research misconduct, mentorship responsibilities, handling of data, responsible authorship, and questionable research practices. The Office of Research Integrity provides access to various resources: videos, web modules, online training, etc.